We have to review this one a bit differently since its buffet style and we wouldn’t want to overwhelm you by listing every item we tried! 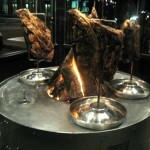 Fogo De Chao is an authentic Brazilian steakhouse with 20+ locations in the United States. Fogo features a gourmet self-serve salad bar with over 30 items including fresh cut vegetables, imported cheeses, cured meats and Brazilian side dishes. Our favorites include the prosciutto, smoked salmon, sun-dried tomatoes and string beans. There were only a couple of things we disliked, namely the fresh mozzarella (blah and bland!) and hearts of palm. There is an option to eat only at the salad bar (if you want to skip the meats) – but it’s still pricey. 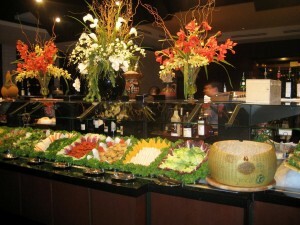 This is not your typical salad bar and you will probably go a little wild when you see all the delicious options. However, be careful not to stuff yourself since the main course hasn’t started yet! Now onto the main event…the meats! Part of what makes dining here so unique and exciting is that the meats are brought to your table, sliced, and served by a gaucho chef. These chefs are constantly circulating the restaurant, ready to serve you from their selection of 15 different fire-roasted meats. Choices of meat include: sirloin, filet mignon, ribs, lamb, pork, chicken, etc. This is a dream come true for all you carnivore foodies! We tried about 8 various meats and enjoyed half of them. The rest were tough, chewy, or fatty. One of our favorites is the Picanha (top sirloin) which is tender and flavorful. The chicken leg is juicy and a bit sweet tasting – excellent! The bacon wrapped fillet was a big disappointment. It was so chewy that after trying it, it ended up back on our plate! Fret not though, you will also find ones you like. It is worth noting that your meal includes limitless cheese bread, crispy polenta, garlic mashed potatoes, and caramelized bananas. Be sure you try all of these as they they are amazing (especially the cheese bread)! 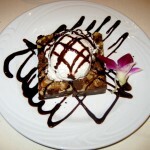 If by some miracle you still have room for dessert, Fogo offers an extensive selection. Being chocolate lovers, we opted for the molten chocolate cake and the chocolate brownie, which are both served with ice cream. 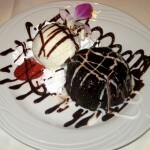 The portions are large and both were very rich and chocolaty. These rank in our top-tier of desserts we’ve had (especially the molten chocolate). Be aware that the desserts are not included in the buffet price. We had reservations and our group was seated promptly. Fogo really knows how to treat their patrons, and they go the extra mile in trying to accommodate and please their diners. Since this is an upscale eatery, one might expect the service to be spectacular and we can honestly say that the service bedazzled us – the waitstaff was outstanding. They were warm, friendly, and well-informed about food items and wine pairings. Without making their presence known, the waiters refilled our drinks, and effortlessly replenished our ever-low supply of complimentary sides. (Again, the cheese bread, caramelized plantains, and mashed potatoes are not to be missed, but save room for the meats and dessert.) It was nice to see that the salad bar was kept meticulously organized and very clean. We never had to flag anyone down, as there always seemed to be a waiter close by who kept an eye on our table in case we needed anything. We noticed that all the waiters collectively took care of all the tables. We felt comfortable and taken cared of…ahhh sweet contentment! At no point during the meal did we feel rushed. The valet was on the slow side, but it was a busy night. Still, Fogo impressed us because the service was phenomenal. Since Fogo De Chao is downtown, there is street parking and valet. In the front, they have some meats cooking slowly in the fire. After walking in, you are greeted with cherry and mahogany colors, which create a classy but warm vibe. There are beautiful chandeliers that bathe the whole room with a soft yellow glow. It feels spacious inside because the tables are not tightly packed. White linens, exposed wood beams and fancy silverware add to the ambiance. Furthermore, the Brazilian decor on the walls is lovely. Combined with the traditional gaucho servers, the essence of a Brazilian steakhouse shines through nicely. Because of the versatility, it is great for a romantic dinner or a large office meeting. This is a place to try at least once, and becomes especially worth it if you go during lunch! I’ll start off this review by paying a compliment. I’ve had the pleasure of dining at this upscale restaurant on two prior occasions, and I must admit that I thoroughly enjoyed my visits. Not only is the food remarkable, but because the staff continually make rounds with various types of meats, there is absolutely no excuse to leave hungry (not to mention you have access to a sizable buffet). I would even go so far as to say that Fogo de Chao was easily one of my favorite eateries overall. Back to the second call- a man answered and told us that our reservation was being canceled because we were 5 minutes late. My heart sunk. Not only was this night 3 years in the making, but it ended with a heartless and swift decision by the restaurant. Within the next 5 minutes, we passed by Fogo and were stranded in thick traffic on Congress with no idea where to eat or what to do. I was in utter disbelief that this happened. Despite calling ahead of time and receiving verification that our table was safe, the restaurant chose to end our reservation on a whim with no regard for the preparation and thought that goes into such an outing. Fogo is not cheap mind you, so most of us who choose to eat here probably do so after some deliberation and planning. At the end of the day, I felt as though I had failed my girlfriend. How could a restaurant do this, especially on Valentine’s Day when planned dinners are most certainly a big deal? Because it’s difficult to predict traffic on holidays, I don’t believe that 5 minutes is a fair cutoff point. Not only this, but I called twice to ensure that our spot was not given away. All in all, I feel that the Fogo de Chao destroyed my high expectations. After sitting in the middle of Austin with no idea what to eat or how to make this day special for my girlfriend following Fogo’s decision to cancel my reservation, I can sadly say that I will not be going back. At the end of the day, they lost a once avid customer and ruined a beautiful evening for me and my Valentine.